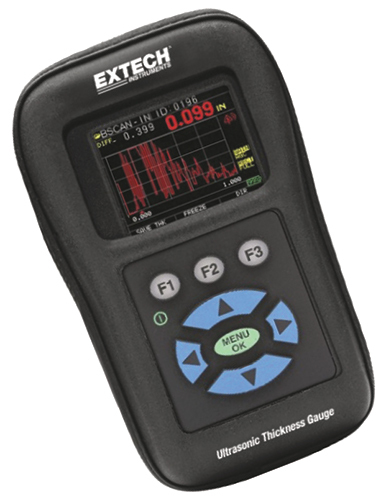 Extech Instruments, Nashua, NH, introduces its TKG Series of ultrasonic thickness gauges, designed for nondestructive thickness measurements on various engineered materials. One common application is measuring the wall thicknesses of steel structures where only one side is accessible. The units also are used to detect thinning areas and corrosion buildup in steam lines, boiler tubes, storage tanks and pressure vessels. TKG gauges also are used to measure thicknesses of metal components found on aircraft sections, ship hulls, heavy equipment and construction vehicles and bridge structures. Features of the units include a compact design, one-handed controls, intuitive interface, easy-to-read LCD display and versatile alarm settings. Advanced features include user-configurable fast minimum/maximum threshold settings, which, when combined with vibration feedback and visual flashing alarms, will reduce the likelihood of missing critical thickness parameters. Other features include a wide thickness range—0.040 to 20 in., quick display of min./max. thickness values, and auto-zero on unit start-up. The base model TKG100 does not display thickness measurements as waveforms; the mid-range TKG150 includes waveform display, an echo-to-echo feature to ignore paint and coatings, and a vibration alarm; and the high-end TKG250 includes color waveforms, non-encoded B-Scans with color-coded alerts, and automatic datalogging.